Olyseum is the collaborative sports social experience. It’s a platform where fans can access exclusive experiences on a social marketplace created by their favorite sport stars, while both get rewarded for their engagement on social content. Our main goal is to create the most exclusive experiences in the world, and to provide them to real fans. In Olyseum you will find great experiences created by stars and a lot of content from them. Besides that, all your interactions with these content will give you rewards, in the form of OLY. You can use OLY to access our experiences marketplace and get a closer view and feeling of your preferred stars. The OLY token is our virtual currency. You will receive it as a reward for your activity and engagement. You can use it to access exclusive experiences created by stars in Olyseum. An ERC-20 utility token working on the Ethereum Blockchain, OLY is the centerpiece of a reward system for fans and stars, providing access to exclusive experiences on our social marketplace. It works also as a flexible mechanism to manage unique and innovative marketing, advertising and engagement engines. It has different uses, depending on what kind of Olyseum user you are. If you are a fan, you can use it to access exclusive experiences on a marketplace created by sport stars. If you are a sport star, you can use it to sell these exclusive experiences and to reward your fans’ engagement on your social channels. If you are a brand, you can use it to advertise and promote your products on a way that is transparent, efficient and that incentivizes your potential customers. OLY can be purchased or received as a reward for your activity within the platform and in other social channels. 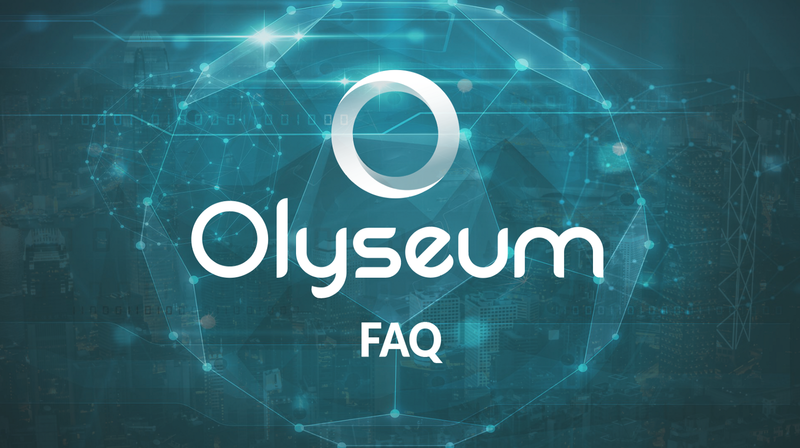 To deposit OLY in your own Olyseum wallet, first you need to be a registered user on the platform (link). Second, you need to go to the Wallet area (link). Third, you copy your Olyseum’s wallet address by clicking on the button Deposit. Finally, you have to send a transaction from your own wallet to the copied wallet address. Yes, OLY tokens can be purchased within the Olyseum platform. It’s very easy: go to the Wallet area and clic the button “Buy OLY”. After that, you will need to fill your credit card or paypal details and clic the button “Buy”. OLY tokens are created to access rewards, offers and discounts in the exclusive marketplace of Olyseum, and to pay advertising campaigns. But, as an ERC-20 token on the Ethereum blockchain, the OLY token can eventually be also transferred to a personal wallet outside of Olyseum and exchanged for any other cryptocurrency or FIAT on the secondary market. The price of a token will vary over time according to different business and market parameters. The objective will be that its price equals the value perceived by its utility on the Olyseum platform. The amount of OLY tokens stored on your ERC-20 wallet are yours and only yours, and cannot be lost if you don’t share your private key with anyone. Then, in case you use your OLY to access products and services offered by Olyseum on the platform, you will pay with a transaction from your wallet to the Olyseum wallet within the Olyseum platform. You can check your balance within the platform, in the area Wallet. You can also check your balance using any other external interface to access a wallet address on the Ethereum blockchain. You can buy an experience from the marketplace area by selecting it and clicking on Buy. You will need to provide your “payment password” to make the purchase effective. Your payment password is a normal phrase that will decrypt your private key and perform the transaction for the payment on the Ethereum blockchain. The OLY token is a cryptocurrency based on the decentralized Ethereum Blockchain, meaning it can be transferred from a wallet (for example, your member wallet in Olyseum) to any other Ethereum wallet. From the Wallet area you can withdraw some amount of your tokens to another Ethereum wallet address. A star is an individual publicly recognized. In our first phase, Olyseum has only sport stars, elite athletes; in the second phase, as a network that brings stars and fans closer together under a collaborative and efficient system, we have plans to open the platform also to other kinds of stars, from realms such as fantasy sports, music, fashion, movies and tech. Olyseum is growing its community of supporters day by day, and part of this growth is related to the stars we recruit to make them accessible to their fans on a different, more engaging and exclusive way. We are making efforts to add more stars every day. Note that, even if you don’t see an exclusive community of your preferred star on Olyseum, you could have his posts on the news feed. If you can’t find your star on our stars’ communities or news feed, you can write us asking to include him: stars@olyseum.com. We will try our best to bring him to Olyseum! We, at Olyseum, believe that a social network should be really social and share with its users part of the value generated on it. That’s why we created a Blockchain-based loyalty program rewarding engagement, transparently and efficiently. Olyseum is built on a way that boost and viralize content and interactions, so every action you perform in the feed, it’s being reflected on the original network of the content. This way, when you like, comment or share a publication of any of your stars, the system will also do that action on the original publication. But… with a subtle but important difference: you will be rewarded for it. Of course: if you help us grow, bringing your friends and -hence- helping us to create a more interesting social network, we have a reward for you. That’s the logic and fair way to be, and that’s how we are in Olyseum. You can check your balance of OLY in your Wallet area. This OLY can be converted into OLY tokens whenever you want through the Redeem button. The rewards are based on advertising. In Olyseum, as in life, every action has a consequence. And in our case, the consequence is a thank-you prize for making it possible for the wheel to turn. Advertisers pay for their promotion in Olyseum and we allow them to share part of their budget with you, in compensation for your interaction with their campaigns. All of this, done by a transparent system based on a blockchain, that allow users to verify that we are being fair and transparent with the funds and conditions. No, every activity, no matter when you do it, it’s being rewarded. What it may change it’s the amount of reward that will give you, regarding the current/s active advertising campaign/s in course on the platform. No, we don’t require to connect your personal accounts on any other network in order to register or explore Olyseum. But we strongly recommend doing it, and here is why: we will be able to give you rewards for your activity, both within and outside of Olyseum. This means that, first, we will be able to replicate your activity under your name on the original post and give you a reward for it (we will never publish anything you didn’t publish by yourself). And second, we will be able to track the activity your do on your social networks related to our stars, and reward it for you in Olyseum. So, this way, you have the chance to continue interacting with your stars’ related content on your social networks and have a reward waiting for you on Olyseum, or you can choose interact with it inside of Olyseum and get higher rewards. It’s a social marketplace created by Olyseum and its stars, where you can find awesome exclusive products and services (experiences) of our stars. You can access the marketplace with OLY and in some cases also with FIAT. It’s designed in a way that these experiences, that can’t be bought only by money, will be able for you, even if you can’t afford what it’s suppose to cost. For some experiences, you just need to be a good fan and interact with your stars’ related content in Olyseum. Have a great experience! A community is the are where the start makes you feel like in their own home. They show you its profile and will upload new exclusive content. On their own community (every Olyseum’s star has one), you will also have all their social networks content concentrated in one and you will be rewarded for your interaction with them. Besides that, you will have access to an exclusive marketplace with personal products and services to be really close to them and have dreamed experiences. Olyseum aim to be the place where stars and fans engage. In case you are a star or an influencer, you can apply for your own official community in Olyseum. Please, write us at apply@olyseum.com. Of course, you can enter a new proposal on our “List of wishes” in the Forum Area and share it with your friends. The most popular a star-wish becomes, the most probabilities it has to have the star and its experiences ready for you. We will do our best to achieve including as much stars as we can! You can refer fiends from your Profile area and clic on Invite. The more friends you referred register on Olyseum, the more rewards you will have. Happy sharing!